I have never been to Mardi Gras in New Orleans and I am sure I am missing out on a lot, even though, I think today’s weather isn’t great down there. I like Nola and had a very interesting trip there in 2008 with the Society of Wine Educators conference. At the time, I wrote this post on my blog which has been one of the most widely read posts in the six years I have been writing this blog. 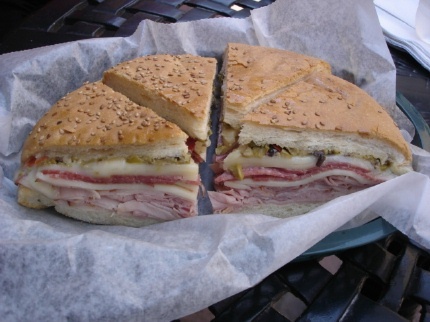 Who knew – the Muffaletta was such a big draw? I wrote this post a couple of years ago but not too much has changed except that I went to New Orleans this past summer for a wine conference, my third trip to the city. I got to explore a couple of new restaurants, have beignets for breakfast and to see the river again in all its glory. I like NOLA with all of its particularities and it certainly is the place to be today. Maybe I will just wear some beads to celebrate here in frigid New York.